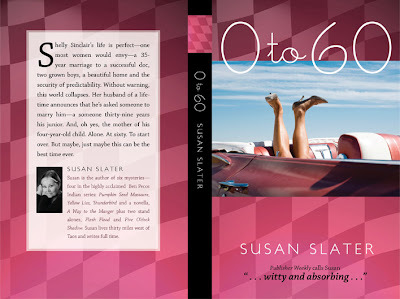 0 to 60 is Susan Slater’s first venture into women’s fiction with an all too true-to-life story of a woman whose world changes in an instant. Stunned by Ed’s revelation minutes before the party that he is leaving to marry his much younger receptionist, Tiffany, the mother of his four year old daughter; Shelly isn’t sure how to move forward with her life. Suddenly everything that she has worked so hard to build for the last sixty years has crumbled around her, leaving her on her own with decisions she never expected to make. Does she want another mate? Sixty is a long way from sixteen, which was the last time Shelly was in the dating game. Is it possible to still find Prince Charming? Or is sixty some magic number that once past, you cannot collect the rewards? Still, it’s worth a try. Soon she enters the most exciting phase of her life learning many surprising things about others and even more about herself. In the lively spirit of books such as The First Wives Club and The Starter Wife, Susan Slater creates a heroine to be reckoned with- one who is endearing and unwavering and serves as an inspiration to jilted wives everywhere. Susan Slater is an accomplished writer with six mystery novels to her credit and a seventh under consideration. I am a big fan of chick lit and I thoroughly enjoyed reading this book. It was a very fast read for me. I finished the 299 page book in a matter of 2 days. It captivated me from the start and held my interest throughout. This is definitely one of those books that is hard to put down! Although I am not that close to 60 years old just yet (I am 31), I found myself connecting with the main character Shelly. I am going through a divorce right now so many of the feelings she is having I could relate to. I felt her anger and her pain for the situation she is placed in. I loved her strength, perseverance and positive attitude and these traits in particular made her endearing to me. She is someone that I would look up to. The plot is fast paced and the author places many twists throughout the book. I really enjoyed reading about Shelly’s numerous experiences in the dating world especially when she gets into online dating. It was funny to see the types of guys that she encountered online because it is oh so true in real life too! There are plenty of duds out there for every good match. Thoroughly entertaining and heartfelt, this is an excellent book for all women to pick up for some interesting summer reading.